Hackathons are no longer the exclusive domain of tech geeks. Several hundred big companies in other industries now organize them, including firms in industries as diverse as airlines, cars, telecommunications, beer and banking, as well as governmental and public institutions. Finnish Customs recently participated in a public service hackathon during which it challenged participants to imagine solutions that would make it easier to access information on Customs regulations and procedures. The experience ended up being extremely beneficial and allowed the organization to ‘stretch’ its thinking around what is possible. Finnish Customs has been a forerunner in developing digital services, introducing its first online service for intra-European Union (EU) trade back in 1999. Economic operators have subsequently been able to submit import declarations in electronic data interchange (EDI) format since 1992 and in XML format since 2009. Currently, 90% of the services offered are digital and available 24/7, and Finnish Customs invests 15% of its operating budget on information and communication technology (ICT). The methodology underlying the development of ICT projects has been updated to make it leaner and more agile, and new job profiles such as product owners and service designers have been introduced. In 2016, the Finnish Government decided to digitalize all public services. As a result, Finnish Customs started a programme to develop customer-oriented digital services the same year, which would be user-friendly while enabling to minimize interaction between its customers and Customs officers. In order to boost the development of such services, Finnish Customs recently participated in a public service ‘hackathon’ organized in the autumn of 2016 in the lead up to the Kick-off of the celebrations marking Finland’s 100 years of independence. In an ‘online country’ like Finland, with 72% of the population using the Internet daily and 2,2 million mobile phones sold during 2015, hackathons are an exploding phenomenon. A contraction of two words ‘hack’ and ‘marathon,’ a hackathon is an event where teams (including developers, but sometimes designers and project managers too) collaborate on a computer project – usually the development of application software – over a very limited period of time (such as a week), with the goal of quickly coding something clever (hence the word ‘hack’) and doing it intensively, without stopping (hence the word ‘marathon’). It is also often a festive competition at the end of which a jury chooses and rewards winners. During the public service Hackathon, twenty-six multidisciplinary international university student teams tackled different digitalization challenges over a three-day period (the main event) presented by the Apotti Project, the Finnish Patent and Registration Office, the National Police Board, the Finnish Defence Forces, the Finnish Border Guard, the Ministry of the Interior and Finnish Customs. The organizations asked the students to develop solutions that would make it easier to use their services and which would increase the use of Internet and mobile services. During the main event, the student teams had to develop prototypes of their solutions with feedback and guidance provided by coaches from participating organizations. Once the hackathon had ended, they had two months in which to finalize the development of their solutions before presenting them in front of a jury. As the hackathon was also part of a university course, lectures on service design, presentation technique, process design, and project and change management were also offered during the event. Finnish Customs’ hackathon challenge concentrated on the following questions: when and how should customers interact with eCustoms, and how could the interaction be facilitated and minimized? The students were invited to invent solutions, with the help of six experts from Customs, that would help the service to better serve its customers when they were travelling, ordering items from abroad (web shopping), receiving gifts from abroad, or bringing items across the border. The solutions had to ease of the life of customers, be innovative and user-friendly, enable easy interaction with eCustoms, and showcase the possible look of a new, interactive and digital Customs service. A decrease in customer service contact should be achieved through user-friendly e-services and electronic exchange of information solutions, which might not necessarily be developed by Customs. At the end of the main event, each team pitched their solutions for three minutes, and each participating organization then chose a winning team to compete in the finals. Coaches evaluated the solutions based on criteria such as feasibility, efficiency, impact, innovativeness and customer experience. Detailed descriptions of the benefits were presented in the teams’ final reports. The teams also had to think about how these benefits could be tracked and assessed, establish implementation requirements, foresee risks, and plan budgets. Participating organizations learned a new approach to producing customer-oriented services by combining service design, lean management and digitalization. Key words in this process were the re-use of data, the co-development of services and the relocation of services to where customers are and via media that they use. The ground-breaking principle was that organizations should not expect the customer to find them, but rather that they should know where the customer is operating from at a given moment. The best team working on one of Customs’ challenges was ‘Team Convenient Travelling.’ Their innovative solution automatically delivered tailor-made information on travelling rules and restrictions to passengers. The solution combined online declaration services to services such as budget tracking. The team chose a mobile banking application as the service delivery platform due to the increasing number of users of these kinds of services. 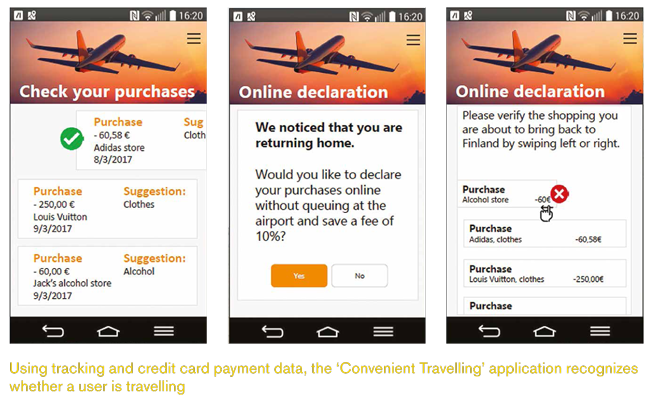 In addition, the application could be integrated into other platforms such as travelling applications. 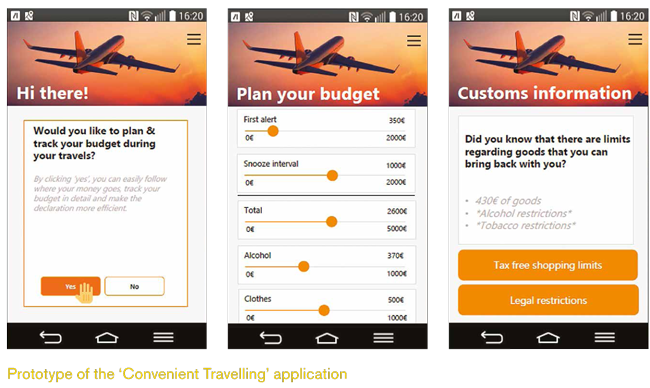 The application triggers – becomes interactive – when travellers begin their journey, suggesting the use of a budget tracking device and providing information on Customs restrictions. At destination, users can track their budget, and visualize the products that they have bought including related taxes. If the budget limitation is exceeded, the application sends an SMS alert to users. When returning home, the application will advise users, for example on their return flight, whether it is necessary to submit a Customs declaration. Upon arrival, users pay any duties and taxes that may be due. The solution creates a win-win situation. The traveller does not have to search for Customs regulations and gets access to a new service – a service provider can offer this new service to its customers with modest implementation costs. In addition, awareness of Customs compliance procedures and other regulations is increased, and taxes are collected in a reliable and efficient way, with no development costs to be borne by the Customs administration. The hackathon’s winning concept was the ‘Ilona Service’ designed for the Apotti Project, an application which aims to improve the quality of life of persons who take care of a family member at home by connecting them to public and private service providers. Using ‘artificial intelligence,’ the application understands normal speech, collects and analyses data, and helps users improve their social life, for example, by suggesting different activities and arranging substitute carers. A hackathon does not necessarily provide readymade solutions which can be implemented straight away. After the hype created by the event, obstacles came back to haunt the participating organizations, such as issues relating to legislation, ICT architecture, limited budget and resources, and silos in operations. Therefore, a small group of digitalization experts have been appointed to overcome these obstacles in order to execute the results of the hackathon. Look good – make services visually attractive. The hackathon experience inspired Customs to start integrating co-development platforms as well as searching for partners, and to move forward utilizing new possibilities while beginning to explore the use of technologies such as mobile authentication, chatbots, query wizards, gamification, and mobile services. In fact, launching agile, small-scale experiments instead of administratively burdensome large-scale and time-consuming projects requires courage and perseverance. 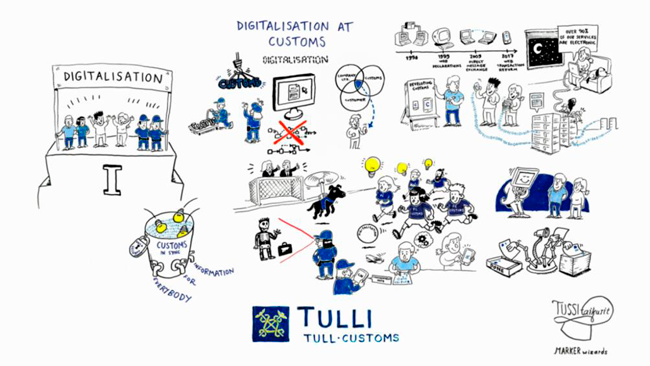 Finnish Customs believes that the innovations that will eventually revolutionize its services will be discovered by combining the expertise of Customs and other service providers. Thus, Customs administrations need to fully dive into existing digital ecosystems and cross-sectoral ‘borders’ in order to streamline the customer experience, and by doing so save resources, simplify processes and enhance compliance.